Sidewalks are the walkways that are built to add convenience for the pedestrians; however, in New York City there are certain rules and regulation for constructing sidewalks: in case any of these restrictions are violated, sidewalks concrete repairs are recommended. Construction Repair NYC is a reliable concrete contractors NYC that has gathered extensive knowledge and expertise in offering assistance in landmark sidewalk repair NYC job-works along with concrete curb installing services for its clients. Construction Repair NYC is not only recognized as one of the most renowned customized concrete installation contractors in New York City and surrounding areas, the company has also earned extensive professional proficiency in concrete curb installing services, backyard concrete renovations, smart and utility concrete repair Brooklyn services, and concrete paving Yonkers NY management skills. If you are looking for hiring concrete curb installing services with reliability and cost efficient at faster turnaround time, we are one of the best options for you in New York City area. Concrete violation removal contractors are enlisted government approved service providers who can help its clients in removing sidewalk violation waste materials adhering to all legal restrictions recommended by city admin bodies. Besides working as an approved concrete violation remover NYC contractor, Construction Repair NYC also works as steel & concrete curb fix NYC expert. Concrete repair works, be it for commercial premises or in residential community, is a complex job and besides knowledge of concrete sidewalk repair and construction, the service provider must have sound knowledge of concrete repairs NYC and related laws to get the job done in litigation free way. 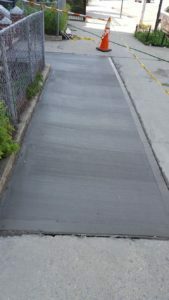 Regardless, if you are looking for walkway concrete repair Bronx NY as well as sidewalk concrete repair Brooklyn, Construction Repair NYC is your one-point solution. In the city of New York, the maintenance and upkeep of sidewalks is the responsibility of the property that abuts a particular stretch of sidewalk. In case any sidewalk is constructed in a certain way that violates any of the rules, then the owner of that property is also responsible for breaking down the sidewalk and also for sidewalk violation removal Manhattan. The first step is a mandated court appearance. Any court appearance for concrete violation removal Queens could be done by the violator himself instead of deputing someone else. But if you are not fully aware of the rules pertaining to sidewalk concrete renovations Queens, NY then it is advisable to depute an experienced concrete contractor in Bronx, NY to appear on your behalf.In case you are able to get the violation dismissed, then it’s fine, but in case you are convicted of a violation, then you need to pay the requisite fine and also produce a certificate of correction after getting the necessary Long Island sidewalk repair carried out. The process of obtaining this certificate might include the drafting of your building plan and get it approved as well. This can also be taken up by good concrete contractors Brooklyn, New York. We have long years of experience in different types of construction and repair work, including concrete driveway repair Bronx, NY, sidewalk repair, and also sidewalk violation removal. We offer our services in more than a dozen areas of New York City like Queens, Manhattan, Long Island, Bronx and others. We are enlisted contractors for removal of sidewalk violation repair work. We would make sure that your sidewalk constructions or repair all adhere to government regulations. We have extended experience in concrete curb fix works as well. Offers cost efficient service with zero compromise on service quality.